It’s the Christmas season, yes. But it is also another season… the end of the semester! Can I just get a giant YAAAAAAYYYYY!? I got my final grades yesterday and was absolutely elated. The class that I was crying over in November and completely stressed about in December (ok fine, all semester long) turned out great! And so, now begins the time of closing everything down and preparing to enjoy Christmas break! 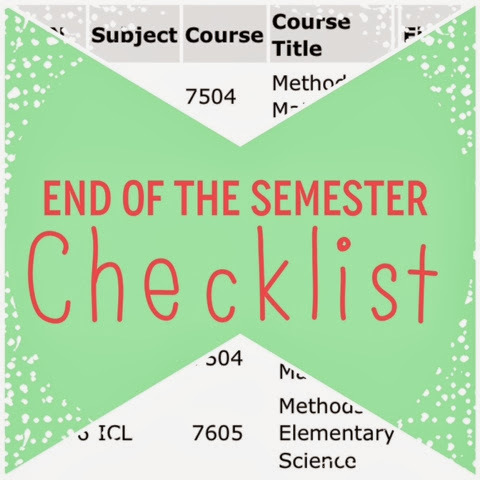 As with the end of anything, there is always a process and routine for the end of a semester. This only applies if you rented textbooks. I only rented one this year and bought the other two. I created a file in my office filing system for my textbook receipts. I also bookmarked Chegg's return label on my computer so everything would be easy to find when it was time for returning. Renting: You only need to be in a hurry to do this if you rented your books. Last year, I rented from Amazon.com and the book was due back to them by the date of my last final. And I LOVE Amazon, but that’s not really helping me if I need the book for my final. This semester, I rented from Chegg.com and (not only was it cheaper and more organized) my book only had to be in the mail by the due date (which was 4 days after my last final, by the way). Selling: If you bought your books and are rushing out to sell them back, STOP! You might want to hold onto them for a while. Like, until next semester. According to this this article from the NY Times, the best times to sell back books are January 7-13 and August 20-26. Why? Just the simple concept of supply and demand. Students have their schedules, they’re looking for the books, and bookstores are selling out of them. Therefore, they are willing to pay you more money to purchase your book back. And who wouldn’t like that? I am usually pretty good about keeping computer documents named and filed correctly. 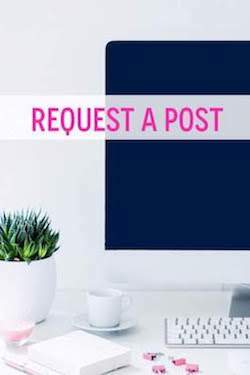 In fact, ever since I pinned this Filing System from College Prepster onto my Pinterest Study board, I’ve followed it precisely (with one little exception). The only thing I do differently is color code my folders and documents using the Label feature on Mac: Green if they are in progress, Gray if they are complete. Anyway, because the final week of school can be hectic, there may be documents saved to the desktop or other things that just need to be quickly filed away in the correct place. This is a great time to do that. And turn all of those remaining green assignments gray because the semester is complete! Okay, fine. I have two exceptions from TCP’s filing system. I also keep a file for each of my current courses right in the upper right hand of my desktop for easy access (and a constant reminder of what I should be doing). So, I also take this time to close those folders and place them in the appropriate place (where I, hopefully, never have to see them again). ratemyprofessors.com is one of my all time favorite websites! When I’m registering for courses, I always read about my professors because I like to know exactly what I’m getting myself into. Since I find this website so helpful, I like to contribute to it and be helpful to others: good or bad; organized or disorganized; effective or ineffective. I write it all here. It never crossed my mind to do this until last semester. My (favorite!) professor told us that they keep trying to edge her out of teaching at our university (because she only teaches one class). There are two things that keep her working there: a) Her students love her and continue to give her great reviews b) Her students write e-mails to the head of the department about how wonderful she is. If you had a truly exceptional professor this semester, send the head of the department an e-mail about it! Additionally, if you had a professor that you really liked be sure to thank him or her and tell them the reasons you enjoyed the course! As a teacher (and a teacher in training), I can tell you that we work really hard to plan e-v-e-ry-thing from class actives to Powerpoints to rubrics to test questions. Hearing that someone appreciates all of that work is absolutely phenomenal. So go ahead, thank your professor! If you are e-mailing your professor to let them know you think they were awesome… and if you think they thought you were awesome, too… you may want to ask if you can use them as a reference in the future. This is a great time to do that since you (and all of your awesomeness) are still fresh in their minds! 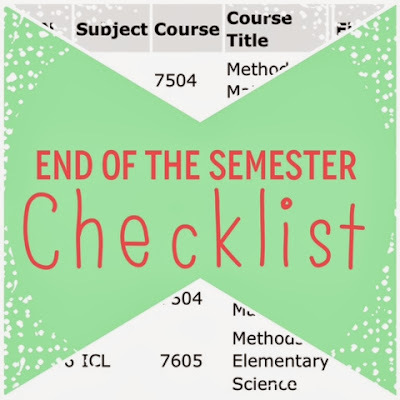 Well, let me state the obvious: One of the most important parts of closing out the semester is checking your grades. If you kept up with them over the semester (like I did) you should have a pretty good idea of what you’ll be making. However, it’s still wonderful closure to see the final thing. Hey! The semester is over! Congratulations! Plan something relaxing, fun, exciting, or celebratory to look forward to! This year, the end of my fall semester just happened to coincide with a family vacation to the Caribbean (which was the most amazing thing to look forward to ever)! Here are some other ideas for ways to celebrate all of your hard work: schedule a massage or a mani/pedi, pick up a celebratory bottle of champagne, or go out for cupcakes or Margaritas with your classmates. What are some other things that are important for the end of the semester? How do you love to celebrate the end of it? !